There is no dinner for two quite as romantic as a meal you prepare yourself in an atmosphere you control. There's no waiting for service, no dealing with inattentive wait staff or loud restaurant guests who ruin the mood, and no waiting to pay the bill when you're ready to leave for the romance to continue. A romantic meal you make allows you to set the stage and be in charge. The food, the music, the table decorations and every other aspect of your evening are things you've chosen to please your romantic partner, and if you follow these tips, it will be an evening to remember. 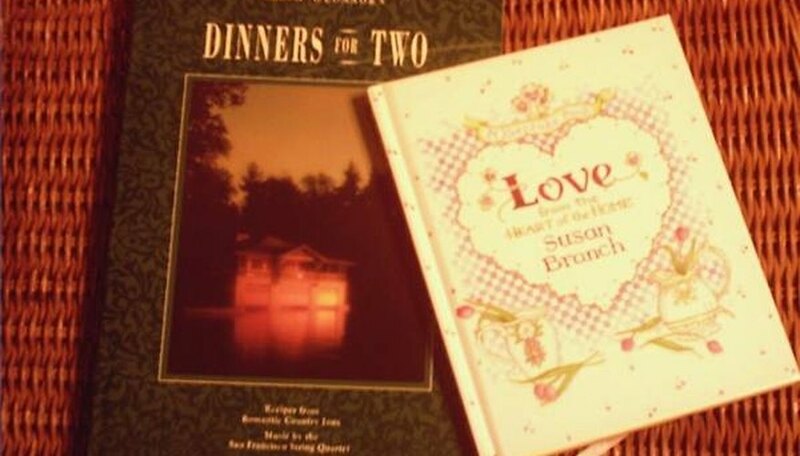 Read both books thoroughly to get yourself primed for preparing a romantic dinner for two. Both have many other tips to add ambiance. O'Connor's book recommends playing classical music along with the meal. Suggestions include Vivaldi's "Spring" from Four Seasons, "Canon in D" by Pachelbel, and "Romance" by Shostakovich. Decide which meal you want to make. Susan Branch's Steak au Poivre with Potatoes Anna, Caesar Salad, Strawberry Shortcake and good red wine is simple yet elegant and romantic. Or you might prefer a more elaborate menu from O'Connor's list of 20 elegant menus, such as Nori Fettuccine and Opihi with Garlic-Chili Butter Sauce, followed by Spicy Rack of Lamb with Thai Red Curry Sauce, Mango Ice Cream Sandwich with Macadamia Nut Cookies and Tropical Fruit Compote. Both books give step-by-step directions for making all the meals. Purchase the ingredients for your chosen menu, and do a trial run on a friend to make certain you can handle the menu without stressing yourself out. The most romantic meal will be romance road kill if you're frazzled from all the work it involves. Or if your romantic partner likes to cook, and it revs up both your sensibilities, ask him or her to help with the cooking. Clean your house two or three days before the big meal, place candles around the house with matches nearby, and get ready the music you intend to play during the meal and afterward. Plan what you will wear and get it ready at least two days ahead. Try it on to make sure it looks right. This gives you time to shop for something else if the look doesn't measure up. Also get a manicure, pedicure, your legs waxed, or your hair cut or colored, and anything else you need to do ahead so you don't have to worry about it on the big day. Make all the meal preparations that you can --- without sacrificing quality of the food --- the day before the big dinner so you don't have to do everything at the last minute. Set the table the night before, too, with your best dishes, wineglasses and silverware. Use your best tablecloth and cloth napkins that are clean and ironed. On the day of the meal, check all the details to make certain everything is perfect. Get fresh flowers for the table centerpiece and other places in the house. Allow plenty of time to get yourself ready, bathing, doing your hair, putting on makeup, jewelry and finishing touches so you're not rushed. Remember to take deep breaths and start cooking. Put on an apron so you don't get food on your clothes. Relax and enjoy the process of entertaining and the romantic evening ahead of you. Planning and advance preparations are the key to a successful romantic evening. If something goes wrong, laugh and move on. A sense of humor adds a spark to romance. Make sure your romantic partner has no food allergies or limitations. You don't want to serve steak to a vegetarian! Miller, Susan. "How to Make Dinner for a Romantic Evening." Dating Tips - Match.com, https://datingtips.match.com/make-dinner-romantic-evening-4968522.html. Accessed 21 April 2019.